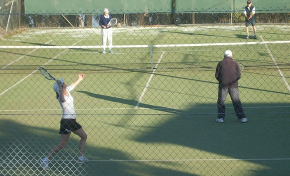 With 6 floodlit, artificial grass courts, Merrow LTC has excellent facilities to enable players of all abilities to enjoy tennis throughout the week. Members have access to our Court Booking System, as well as free balls, free use of the floodlights and access to a ball machine. 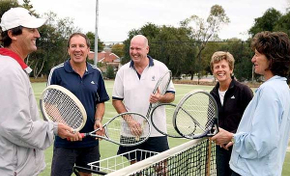 Take a look here at the many ways of getting involved, view our Weekly Tennis Schedule or visit the C﻿﻿o﻿urt Booking System to reserve space on a court for yourself and some friends. Club nights and sessions run through the week for players of all ages. Pit yourself against a fellow Club member of a similar standard, or meet friends for a few casual games. 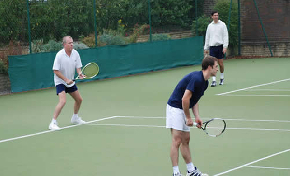 Whether you want to find someone to play against or reserve one of our courts for a quick game, there are plenty of opportunities to play a casual match using our membership booking system. Our Singles (Box) League takes place throughout the year with different groups based on player levels. A great way to improve your game and fitness. 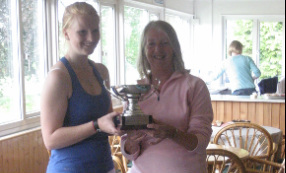 ﻿Merrow LTC has several teams and takes part in various Local Leagues, including Chaucer, Woking and Surrey Leagues. Click to find out more and visit league their websites.